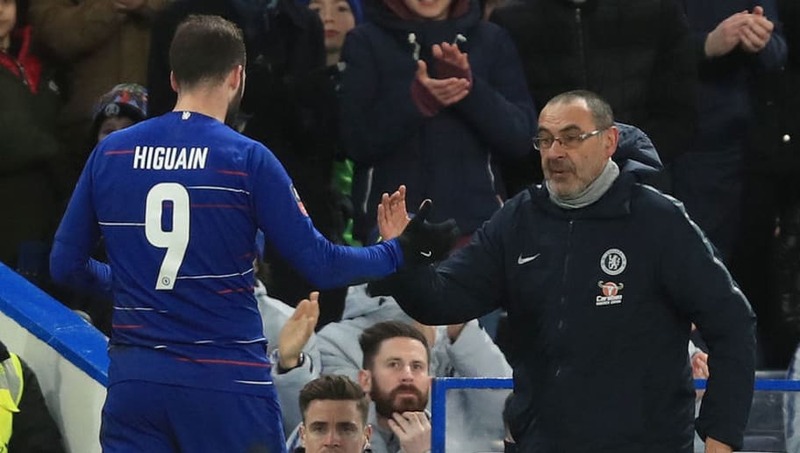 Chelsea striker Gonzalo Higuain has insisted that Maurizio Sarri will get the best out of him after being reunited with his former Napoli coach at Stamford Bridge. The Argentine forward joined the Blues on loan from Juventus in January as Sarri called on his former charge once more to solve his striking problems in west London, and Higuain has made a strong start at his new club. The former ​Real Madrid attacker scored a brace in ​Chelsea’s recent 5-0 win over ​Bournemouth and enjoyed his most prolific season to date under Sarri in Serie A, scoring 38 goals in 2015/16. ​Higuain told ​Sky Sports: “He [Sarri] is the coach that has got the best out of me. “I know him well, he knows me well. I’m hopeful I will get back to that level we had before, this is the idea. He is someone who helps me, knows my game and how to get the best out of me. Higuain enjoyed a successful spell in La Liga with Real Madrid before reaching new heights in Italy with ​Napoli and ​Juventus. The 31-year-old spent the first half of this season on loan at ​Milan, where he endured a less productive spell. Just eight goals in 22 appearances during his time at the San Siro represented an underwhelming return by Higuain’s standards, but Chelsea’s new man insisted he has not arrived in the Premier League with a point to prove. “No, not at all,” Higuain added. “I am someone who always does my best and tries to improve. “It is true there have been a few months that have been harder at Milan but I don’t feel my level was any lower than it was there. After a record season with Napoli, though, it’s hard to live up to that. Higuain will come up against fellow Argentine hitman ​Sergio Aguero as Chelsea travel to face ​Manchester City in a blockbuster Premier League clash at the Etihad Stadium on Sunday.